Basketball is one of the simplest sports to bet on, and one of the easier games to research trends on. There are several types of popular bets that are frequently used when betting on hoops, and we’ll take a brief look into each and explain how each bet type works. Betting on basketball can be a different kind of beast in general because you have to put in the time to study teams and popular gambling trends like road wins, home wins, what teams are playing on limited amounts of rest, and of course taking into account for injured players. It’s much like football in a sense because for the most part it’s not too hard to tell which teams are the best in the league after a few weeks of games, and laying bets against underdogs and covering point spreads and moneyline wagers become a little bit easier as the season progresses. NBA and NCAA Men’s basketball are the two biggest draws when it comes to the amounts of bets placed online and in Las Vegas sportsbooks, with women’s basketball (ex: the WNBA and NCAA Women’s D1 hoops) bringing in a very small portion of sports betting revenue. 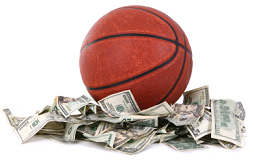 Wagering on the point spread is the most common type of betting done in basketball. Teams are either given points to be added to their end of game total, if they are the underdog or having points subtracted from their end of game total if they are the favorite. If a team is listed as -6 then it is the favorite and if you bet on them they will have to win by 7 points or more for you to be paid on your wager. If you bet on a team that is listed as +6 then your team must not lose by more than 5 points for you to win your wager. In the cases that there are no half points involved in the point spread then it is possible to have a tie, in which case all wagers would be refunded. In basketball betting you have to give odds to the sportsbook, sometimes called “juice”. You need to bet $11 to win $10. This is true regardless of whether you are betting on the favorite or on the underdog. This is also how your favorite online sportsbooks makes money over the course of the year. Betting the points is one of the more popular bets to make, especially online where the lines can be a bit better than ones you would normally get in a Vegas book. Favorites often cover the spread, especially in NCAA games and WNBA games. The margin for error is a little more diluted in NBA games, as favorites may sometimes win their games BUT won’t cover the points – mainly because teams with bigger leads towards the end will often let teams creep back in with charity buckets or just ease up on their defense by taking out regular starters. The second most common type of basketball betting is on the total points of the game. The total amount of points scored by both teams during the regulation period and all overtime periods is considered the “total.” Part of the line that a sports book puts out is the over/under. If a game is listed as +/- 198, then betting on the over would mean that you are betting that the combined total of both teams would exceed 199 points and up. Conversely, betting the under would mean that you would win your bet if the combined score of both teams was less than 197 points or less. When betting totals the same odds of betting $11 to win $10 apply whether you bet either the over or the under. This type of bet is one of my personal favorites, and you can get a sense of how many points each team is going to throw up by simply researching their last 5 to 10 games, how much they score on the road and at home, as well as how well they’ve fared against a particular opponent in the past. Betting the totals is something you should be doing during the NBA season, where teams in both conferences have a lot of disparity when it comes to offensive and defensive strategy, and can make it a lot easier for you to lay a calculated Team Total over/under depending on the teams involved. This is also a popular bet in NCAA circles, where a lot of ranked Division I schools normally put up a lot of points against in-state or division rivals, making it a lot simpler to lay bets on the over on many occasions. In smaller-school matchups, taking the under is normally a good bet because these small to mid-majors don’t tend to put up tons of points on a nightly basis. Moneyline Wagers are basketball bets that do not use point spreads so you are just betting on one team or another to win. Because of the fact that some teams are favored to win over another a Moneyline wager uses odds instead of point spreads. A money line of -250 would be a bet on a favored team and you would need to bet $25 to win $10 – $250 to win $100 – and so on. A money line of +150 would be a bet on an underdog and you would need to bet $10 to win $15. Originally all basketball betting was done with money lines but with the introduction of point spread betting it has taken a less used place in basketball betting. However, you can make the most of this type of bet when you just have no idea if the favorite is going to cover. Also, if you’re picking the underdog this bet makes more sense because while you may have a strong feeling they’ll win, you don’t want to take the risk of the dog blowing their opponent out and not covering the spread either if you had bet the points. This play makes a lot more sense in NBA and NCAA betting because even though you have to lay down more money when wagering on a favorite, the chances of them winning outright are always great and you never have to worry about covering the points. It’s a more worry-free bet as well since you’re just rooting for a team to do one thing: win. Teaser and Parlay bets are sometimes called “exotic bets”. Both Teaser and Parlay bets require that you pick more than one team to win and can sometimes be tough to wager on simply because people don’t like the risk involved. Betting individual games is safer and doesn’t require scouting multiple games just to bet them all in a parlay. With Parlay bets you have the choice of betting against the point spread or by using the money line method, and normally have bets laid on 2 to 4 teams in most cases. The more games you bet on and win, the higher the payout would be on your original wager. Teaser bets are made using the point spread only and the bettor can adjust the point spread in their favor at the expense of lowering the odds that they will be paid on; this isn’t much of a game-changer in basketball as it is in NFL or NCAA football though, where points are much more valuable and more difficult to come by. >> Check out these great articles on Teaser Betting and Wagering on Parlays for more info.